Tomorrow is the annual Kindergarten Character Parade at my son’s school. T went as James from James and the Giant Peach when he was a wee one. B decided to go as a crayon from The Day the Crayons Quit (because we LOVE it and The Day the Crayons Came Home!). Imagine my delight that my child picked a character for which I already have a costume. T was a red crayon for Halloween many moons ago and I knew I had seen the costume, touched it with my own two hands, sometime in the last six months. Easy peasy. Done. No fuss, no muss, no money. I proceeded to check the closets. The dress-up drawer. The craft cabinet. No dice. I waited. I checked the attic (read, the hubby checked the attic). The closet again. The bags in the closet. The coat closet. The dress-up drawer again. The linen cabinet. The bench at the end of my bed under the extra blanket. Nothing. I checked everything one more time even though I had checked it all before. So, I retrieved the random navy blue pillow case I found from a set of sheets we no longer have and felt that this was miracle enough. An extra pillow case. I’ll just make another. And so I went to the craft store and found felt the perfect color blue to match and black fabric paint for the pillow case. I painted on the logo and the stripes. I let it dry. I turned it over this afternoon and painted the stripe on the back side. …the damned red crayon costume. The paint isn’t even dry on the blue one I just finished. If I had wine in the house (which I don’t because it’s on the stupid grocery list), I’d be pouring myself one right now, decorum and good sense be damned. Yesterday was a bad day. I felt it easing in on Wednesday afternoon. Motivation slowly ebbing. The funk descending. By yesterday morning, it had full on settled, weighing down my shoulders, slowing my footsteps. It was going to be one of those days. We are two weeks into a small kitchen renovation. Although the work is coming along and I can see how beautiful it will be when it’s done and the crew is polite, friendly and super conscientious, it is still wearing on my mental sanity. The entire contents of our kitchen have been relocated with the bulk of the “stuff” perched and propped on every surface in my office. Bookshelves are lined with coffee cups and crystal. A giant box containing our new vent hood is behind my chair. The bench next to my desk boasts a giant basket overflowing with plastic cups and water bottles and random bits shoved in between while underneath are stacks of cookie sheets and pots and lids perched precariously in my giant roasting pan. I can practically feel the walls closing in. There is not a pleasing spot to look at in here right now and the physical clutter has started to manifest itself mentally. I can’t keep a thought, make a decision, carry through on a task. I spent yesterday running around town in search of a canvas art piece for a specific spot in the new and improved kitchen and then hours (no joke) online (and yes, I’m still looking. You know, when you have something in mind and need a specific size it’s IMPOSSIBLE to find what you need? That’s me.). By the end of the day, I realized I had not really had a fully formed thought run through my brain all day other than – oh, here’s Pier 1, guess I’ll stop in here and check. Then came a rejection letter. I normally would have let this one go. It was a long shot agent of a very well respected writer I admire, but our books aren’t entirely similar, so I knew it most likely wouldn’t be a great fit (and that’s essentially what she told me in her very nice letter), but it just dug in under my rib cage yesterday and sat with the fog. When the kids came home from school and I nearly jumped with joy that there was no homework allowing me to do the minimum. I went through the motions. I chopped the vegetables for the soup. I corralled them outside. I chatted with my sister. But through it all, I was just blah. Unmotivated. Empty. Depleted. And so I didn’t beat myself up. I just let it sit. I wallowed in the nothingness for a bit. I let it ride. Some days are just like that. Some days we’ve given all we can. Some days the busyness of life catches up and our minds and souls need to turn it off and rest for a bit. I think that’s what mine did yesterday because this morning I woke up refreshed. So I swept. There is only so much cleaning that can be done around this renovation project when so much is in physical disarray, but sweeping I can do. And so I did. I swept the dust bunnies out of the corners, the LEGO’s out from under the couch, the breakfast crumbs from under the table. And as I worked, I swept yesterday up in with the floor detritus and dumped them all into the trash. I sat down at the desk. The desk that is the only surface in this office I have protected, and have knocked off some tasks, made lists of new ones, felt the tickle of inspiration deep in my brain again. It seemed like no coincidence when this tiny sparkle of brilliance from Anne Lamott popped up in one of my feeds this morning . We all need to be self-aware to our self-care. There have been plenty of “those” days that I have been cruel to myself, pushed and prodded and judged myself for my failures. Luckily, I didn’t do that this time. And today, I am better for it. And yesterday is gone, in the past, done. There is no changing it and no need to. Something in my soul needed quiet yesterday and I’m hoping that it received what it needed. Today? Today I can control. Today, I swept. Today, I wrote. Today, I opened the windows to let the air in. Later, I will play with my kids and chat with my neighbors and make plans for the weekend. 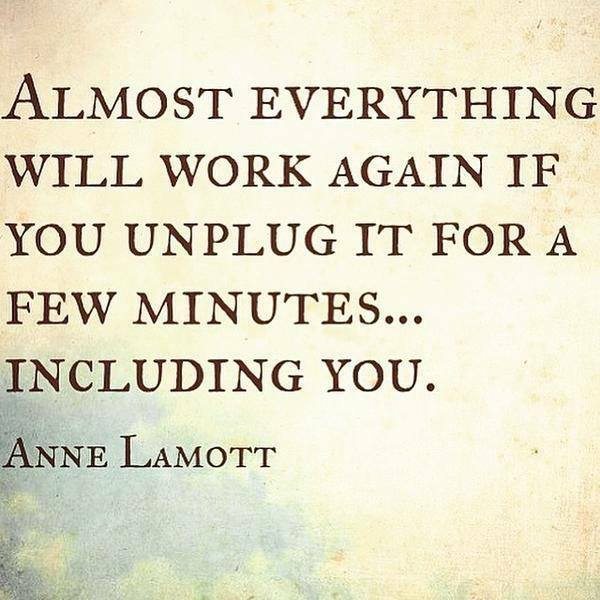 And when the time comes, I will unplug again and let my soul and mind reset so that I can get back to the work at hand.